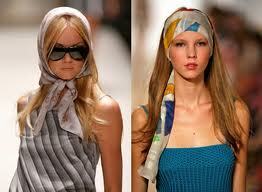 Lately the trend of wearing a head scarf as a accessory has been popping up recently. While this is not personally one of my favorite trends, it can be cute if utilized properly. What do you think of this look? Can you pull it off?? Email me! Ashtynkt@gmail.com. We all know Pucci has some fabulous print headscarves but how do we transform this trend affordably? First of all, there are different ways you can tie your scarf. Lets consult the queen of headscarves, none other than Nicole Richie. Homegirl here knows to work it. Often spotted with a headscarf, this is easily one of Nicole's signature styles. Heres one way to style your headscarf: (personal fave) This look is so cute and holds you're hair away form your face. Loop one end of the scarf into the other end and tie underneath. They also sell headscarves that are specifically made in this style. Nicoles not the only celeb who knows what she's doing. Check out Mischa Bartons chic look of just wrapping the scarf around her forehead, very hippy-esque. This classic turned modern look is absolutely adorable, and simple enough to replicate. Simply fold the scarf over and tie a small knot at the top or side of your head. And last but not least ( in this post anyways) the grandmother look. (Just kidding) . But hey, its still totally workable. The look is pretty self explanatory: wrap around you're head and knot at the neck. Make sure you have some hair around your shoulders so you dont look like an easter egg. To the right: basically the same as Mischa's look above but showing a lil bit of scarf draping down in a very boho way. Need more step by step instruction? Watch this video here to get all the details you will ever need to rock that headscarf and learn 10 different ways it can work.